After switching from Bluehost to SiteGround in June 2016, I wanted to write this Bluehost vs. SiteGround review to help my fellow bloggers and entrepreneurs decide on the best web hosting company for them. I have been blogging since 2012 and manage the blogs of many of my clients, so I have experience in choosing web hosts. *I may earn a commission if you choose to purchase through my affiliate links below (at no extra cost to you!). If you’re planning to start a blog or make money online, or if you already have a site and just want to improve it, read on to find out why I recommend you switch to SiteGround. If you’re a blogger, you’ve probably heard of Bluehost. They’re one of the largest, most popular web hosting companies out there. So of course, when I started a blog in 2012, I opted for a self-hosted WordPress blog and signed up with Bluehost. I even signed up as an affiliate of Bluehost because I loved their service so much. But a few years into using Bluehost, things started to go downhill. My blog would randomly go down without any explanation, unable to load. One time I was telling a friend about my blog and she tried to visit it right in front of me on her phone—and she got an error! In early 2016, I started noticing my site load time was EXTREMELY slow and my bounce rate was CRAZY high. I asked around and did some research and discovered that it was partly my server’s fault (AKA Bluehost) for the slow load times. To be honest I had a HARD time deciding between Bluehost vs. SiteGround. Why? Though lots of people were recommending SiteGround, the problem was, I had never even HEARD of SiteGround, so I was skeptical. Finally, when I contacted a developer I trusted, Grayson Bell from iMark Interactive, and he highly recommended SiteGround—I was sold! I wanted to purchase SiteGround because I had fixed all other load issues on my site—the last piece was just the server response time. Grayson promised me that my site load time would greatly improve with SiteGround, so I decided to take the plunge. But Wait—Why Is Your Site’s Load Time so Important? People are impatient. Think about it, how many times have you exited a site because it was taking so darn long to load? Exactly. Because my site was taking so long to load, people were leaving, resulting in a high “bounce rate.” High bounce rates are bad for blogs and business. SiteGround’s pricing is a bit higher than Bluehost’s. At the time of writing, the cheapest SiteGround hosting plan will cost you $47.40/year, while the cheapest Bluehost hosting plan will cost you $41.40/year. 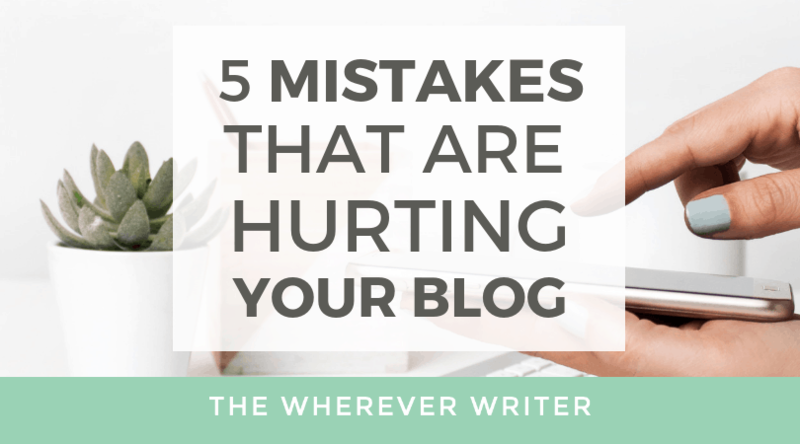 I know that when I was just starting out as a blogger, I just wanted what was cheapest. For you, that may be Bluehost. And honestly, if you’re just doing it as a hobby Bluehost is totally fine. If you plan to take blogging seriously and need faster server times, go with SiteGround. Are you struggling to decide between WPEngine and SiteGround? I had the same dilemma! People kept telling me WPEngine was the best of the best for WordPress sites, BUT here’s the catch: You probably don’t NEED WPEngine right now. And I’m so glad Grayson talked me out of it. WPEngine is pricey. It costs more than Bluehost and SiteGround. If your website currently has under 100,000 visitors/month (like mine), then SiteGround probably gives you the same performance as WPEngine. On top of that, if you hit 100,000+ visitors/month (dream big! ), then you can ALWAYS upgrade to SiteGround’s premium cloud web hosting, or if your site grows REALLY big, they even have dedicated servers and enterprise solutions. After switching to SiteGround, my pages load an average of 9.6 seconds faster! Bluehost’s servers took an average of 2.36 seconds to respond. SiteGround’s servers take an average of just .7 seconds. Yep, after switching to SiteGround, my server response time is 3.5 times FASTER. Thanks in part to faster load times, my site’s bounce rate has decreased by 4%! Admittedly, I made some other changes as well, such as compressing images, using caching, and deleting posts that weren’t relevant to my target audience. I also take great comfort in knowing anytime I had a question, SiteGround’s customer support would answer me quickly. Most importantly, SiteGround made migration a cinch. I was so stressed about migrating my site from Bluehost to SiteGround, and I was worried I’d lose content. I didn’t. The site migration went off without a hitch and there was NO downtime! You have a lot of traffic (more than 10,000 visits/month). When your site has significant traffic, it causes more stress to your servers. In that case, you want to make sure you have a server that’s speedy and doesn’t have a lot of downtime. Your current site has a slow load time. If this is the case, run a few tests to see what the problem is. Enter your website’s URL into Google’s PageSpeed Insights. It will run an analysis and show you what items are slowing your site down. Check the server response time. If it’s 1 second or more, then you need a faster server. You’re not very technical and need lots of help from your host’s support team. SiteGround’s technical support has been top notch. They respond to me within hours and have always been able to help me out. Fear #1: I was afraid migrating my site from Bluehost to SiteGround would take a lot of time and be too complicated. I am not super technical, so I wasn’t sure what it took to migrate a site to a new host. I didn’t want to hassle with it. Reality: SiteGround will migrate your site for you–free of charge. Thankfully, SiteGround offers FREE website migration with their hosting plans. I just sat back and let their support team migrate my site. To do this, I had to give them my login and password to my Bluehost account. Fear #2: I was afraid my site would go down during the transfer from Bluehost to SiteGround. If done incorrectly, a site migration can cause your site to go down. I didn’t want that to happen with mine! Reality: SiteGround reps are experts at the migration process, and my site didn’t go down at all during the migration. My site never went down during the migration process with SiteGround. Fear #3: I had JUST renewed my Bluehost account for 1 year in June, so I was afraid I’d lose all that money I had already paid. I had renewed my Bluehost account a couple weeks before finding out about SiteGround, so I was really bummed to lose out on all that money. Reality: Bluehost has an extremely generous cancellation and refund policy. Bluehost will prorate your refund, meaning if you cancel now, you’ll get refunded for all the future days you didn’t use yet! I was able to cancel my hosting account with Bluehost–and got a prorated refund! To cancel your hosting service with Bluehost, simply go to this page to request cancellation. IMPORTANT: Before you cancel your Bluehost hosting account, BE SURE to get a full cPanel backup of your site and/or make sure SiteGround has already successfully migrated your entire account to their servers. After I requested cancellation, I got an email confirming I had gotten my prorated refund! Woohoo! Step 1: Sign up for a SiteGround hosting plan. Simply to go to SiteGround’s hosting plans and decide which plan you need. It’s helpful because it shows you which plan you should get depending on how many visitors your site gets per month. If you are just starting out, go with the cheapest plan, StartUp, which supports up to 10,000 visits per month. I went with GrowBig since my site gets more than 10,000 visits per month. I recommend you get the Domain Privacy—without it, anyone can look up your domain name and find your name and contact information. Is SG Site Scanner worth it? When you’re checking out on SiteGround, it’ll ask you if you want to add SG Site Scanner for an extra fee. What is SG Site Scanner? It’s a security add-on that regularly scans your website for malware and sends you alerts. I asked my WordPress tech guy, and he said no, you do NOT need SG Site Scanner when you’re purchasing your SiteGround hosting. There are other free security tools out there that will scan for malware, such as Wordfence, which is what I use. So head over to SiteGround, select your hosting plan, select Domain Privacy, but do not select SG Site Scanner. 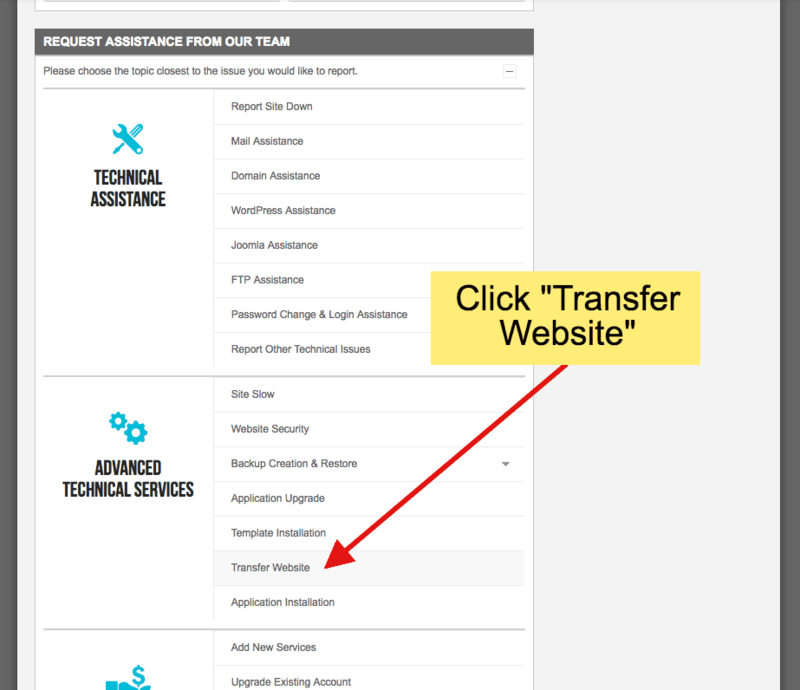 Step 2: Request your FREE migration from SiteGround’s support team. It’s a good idea to make sure you have a full cPanel backup of your site at all times. But if you don’t, SiteGround can help you out. If you’re worried about the transition, SiteGround makes it easy because SiteGround migrates your site from Bluehost to their hosting service FOR FREE. Customer service is great. They reply to me within 24 hours, often within a couple hours. I actually had difficulty obtaining a full cPanel backup of my site, so SiteGround’s support team migrated my site manually, which takes longer. Even so, they did not charge me anything for it. Step 3: If you kept your domain name with Bluehost (like I did), point your domain name to SiteGround’s servers. Thanks to the recommendation from Grayson, I decided to keep my domain name on Bluehost and my hosting with SiteGround. In that case, I had to point my domain name to SiteGround’s servers. Don’t worry, it’s simple. You just log into your Bluehost account and change the DNS servers to point to SiteGround’s. Ask SiteGround’s technical support for help if you need it. Step 4: Wait up to 72 hours for your site to completely migrate to SiteGround, then request a cancellation from Bluehost and get your prorated refund! Make sure your site is completely transferred and you have your backups before canceling your hosting account with Bluehost. See below for how to request a cancellation and get a refund. Get up to 70% off your first year of SiteGround hosting! I have to tell you about this promotion! I bought the GrowBig hosting plan from SiteGround for $179.40 for a year back in June 2016—but YOU could get that same hosting plan for just $71.40 for your first year! After your first year of hosting, it reverts back to regular pricing. Check out the hosting company that made my site faster and better. Would I still recommend Bluehost? Yes, in certain cases. This is by no means a post bashing Bluehost. Again, I used them for 4 years! I would recommend Bluehost if you are a brand new blogger who’s just starting out, and you have a very tight budget. In that case, you can’t beat Bluehost’s pricing, which is still cheaper than SiteGround’s. However, when your blog grows and you take it more seriously as a business, I’d recommend switching to SiteGround. Since Bluehost offers prorated refunds if you cancel, you’ve really got nothing to lose. I used Bluehost as my web hosting company for 4 years, but switched to SiteGround in June 2016 because my site was loading slowly partially due to slow server times. Since switching to SiteGround, my site has sped up significantly and server response times on average are 3.5 times faster. 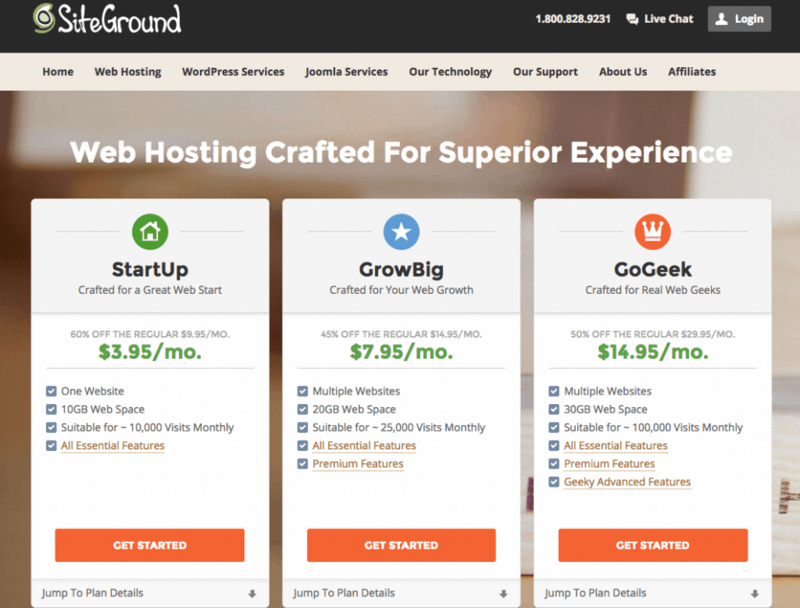 My web hosting company of choice is now SiteGround, which I recommend for anyone planning to make money through their blog or website or planning to seriously grow it. You can get up to 70% off your first year with SiteGround here. If you are just starting out and are on a very tight budget, I think it’s fine to go with Bluehost, as it’s cheaper than SiteGround. If cost is your main concern, currently the cheapest SiteGround hosting plan will cost you $47.40 for the first year, while the cheapest Bluehost hosting plan will cost you $35.40 for the first year. Not a huge difference right now, but only because they’re both running promotions. Do you have questions about Bluehost vs. SiteGround? Comment below! Do you suggest the Start -Up or Grow Big? I am transferring from Bluehost. I am just so fed up with them I downloaded and exported my stuff and canceled. I will be transferring this weekend. I will def use your link! Which do you prefer? By the way I appreciate the detailed post! Feel free to email me your reply! Also do you suggest SG Site Scanner? Hi Shauna! Start with the Start-Up because you can always upgrade later as you grow. You don’t need Site Scanner. Domain Privacy is worth the small investment though. I always get that. I am trying to set up a blogging account and siteground is my preferred choice, but there’s lots of extras to consider before my purchase. Do i really need an SG site scanner, SSL certificate and domain privacy? I’m new to blogging, but really want to start blogging as something that can grow into more than just a hobby. thanks! Definitely get the Domain Privacy–without it, anyone can find out your name and address because it will be public information assigned to your domain! The rest you don’t need (SSL Certificate you can get for free with SiteGround later if you want, and site scanner is unnecessary. There are free security tools). Hey Shelby! Ugh, that is SO frustrating to have your site down and seeing people leave it! I feel you. That’s how my site was with Bluehost sometimes. There is NO need to be nervous about switching to SiteGround! Like I said in the blog post, their Support Team will migrate everything for you for FREE, and they know what they’re doing! My WordPress site looked exactly the same after the migration, and there was NO downtime. Make the switch! And see if Dreamhost will refund you what’s left on your plan. If you have any other questions, let me know! Great post! I am in the process of deciding where to go with my hosting. I am currently with Godaddy and they are the WORST!! Absolutely terrible. Anyway, I am on the hunt for a new host so I am happy I came across your post. Thank you for the in-depth information. SG sounds like a great deal. How do you get the SSL Certificate for free? Is it included in the plan? Hey Kerry-Ann! YES, SiteGround offers FREE SSL certificate, and it IS included with every plan. And their Support Team is so helpful; they can take care of everything for you! In fact, I’m about to make the switch to SSL via SiteGround this week! ?? If you have any questions, let me know. I feel like this post was written for me — wow it’s perfect! Been debating for a while and now all of my fears have vanished. 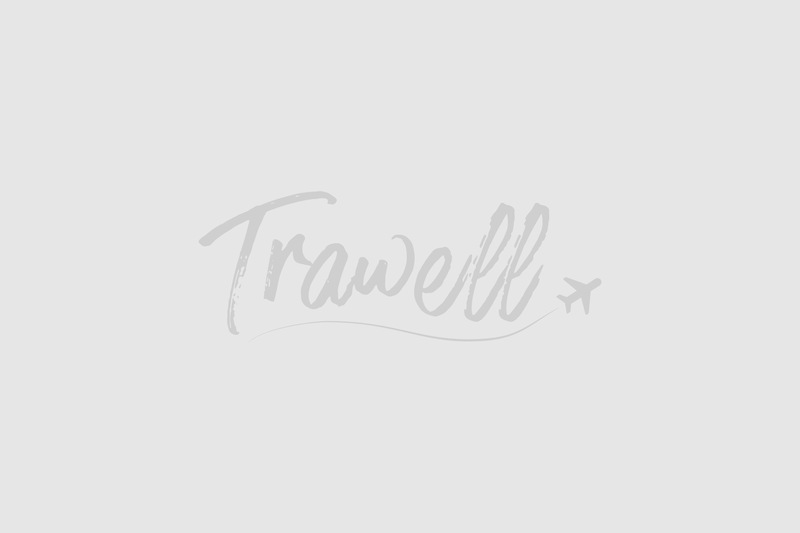 This is so helpful as a solopreneur – digital nomad I really appreciate it! Seems very easy – can’t wait to get it done! Wow, thanks for this awesome comment! I’m so excited you’ll be joining the SiteGround family! Let me know if you have any questions at all. ?? Been with SG for a year and a half, now. Haven’t looked back! I moved to my site to SiteGround from GoDaddy last year, using the free transfer. I have just renewed for another year. Their service is top class. I am in an unusual position of managing my employer’s site on Bluehost, with my own site on Siteground. I had the opportunity to understand Bluehost’s performance before making the move. Bluehost works for a low traffic, small site, but it is not impressive. Siteground is impressive. Definitely a good choice. That’s awesome! Yes, I agree. My experience with SiteGround has been great. And yes, Bluehost will work. But I wouldn’t recommend it, especially if you plan to go big and go pro. Thanks for the comment! Hello! Thank you for this information. I am just starting a blog and am deciding what host to go with. I know you mentioned bluehost is okay to start out with since I’m not sure I’ll actually make any money at this. :) I do care about cost but I also want good customer service and security. If you were to do it over, would you start with bluehost or siteground from the beginning? I don’t just want to go with the cheapest just because it’s cheap. I want it to be as easy and simple as possible and have no trouble getting the help I need. What’s your personal recommendation? Thanks! #1 If your choice between Bluehost and SiteGround is purely motivated by cost, just realize the first year prices for the two web hosts are exactly the same. #2 If I were to do it over, I would have started with SiteGround from the beginning (I just didn’t know about them yet) to avoid having to transfer hosts. Again, the first year price is exactly the same as Bluehost. In the end, though, you’re not doomed if you go with Bluehost. They are a MAJOR hosting company and many popular bloggers love them. It’s just my own personal experience that makes me prefer SiteGround. Previous article How to Start a Blog on SiteGround and Make Your First $1K Blogging!